Habit: Perennial herb. Stem: prostrate to erect, generally several, clustered on 1--several subterranean caudices from woody rhizome. Leaf: simple, base tapered or truncate to cordate, often oblique; basal 1--6 per caudex, stipule oblong, fused to, forming 2 membranous wings on petiole, entire or few-toothed, the tip of each wing free, deltate or lanceolate, generally fringed, blade 0.8--5.3 cm, 0.4--4.1 cm wide, lanceolate to round; cauline petiole 0.3--12.3 cm, blade 0.3--4.8 cm, 0.3--5 cm wide, ovate, oblong, elliptic, triangular, diamond-shaped or lanceolate, crenate, serrate or dentate with 3--4(5) prominent pointed or rounded lobes per side, shallowly dentate, sharp angled, or entire, occasionally wavy. Inflorescence: axillary; peduncle 1--17 cm. Flower: sepals lanceolate, ciliate or not; petals deep lemon-yellow, upper 2, sometimes lateral 2 red- to purple-brown abaxially, lower 3 veined dark brown, lateral 2 bearded with club-shaped hairs, lowest petal 6--16 mm. Fruit: 4--12 mm, ovoid to +- spheric, puberulent. Seed: 2.1--3.1 mm, light to dark brown or gray, mottled brown. Chromosomes: 2n=12,24. Note: Subspecies variable, intergrade, need study; no additional subspecies. Unabridged Note: Subspecies variable, intergrade, need study; no additional subspecies; plants in shade often produce larger leaves, longer stems. Habit: Plant 3--25 cm, +- glabrous or puberulent. Stem: generally not buried, spreading to erect, generally elongated by end of season. Leaf: basal petiole 4--11 cm, blade 1.6--4.5 cm, 1.6--4.1 cm wide, +- round, +- unlobed, irregularly crenate, generally +- glabrous, occasionally shiny adaxially, +- fleshy, purple-tinted abaxially, base generally tapered, tip acute to obtuse; cauline petiole 1.5--6.9 cm, blade 0.3--2.9 cm, 1--5 cm wide, lanceolate to triangular, crenate-serrate, base +- cordate, truncate, or tapered, tip acute. Inflorescence: peduncle 4.5--10 cm. Flower: lowest petal 10--12 mm. Fruit: 5--6 mm. Chromosomes: 2n=12. 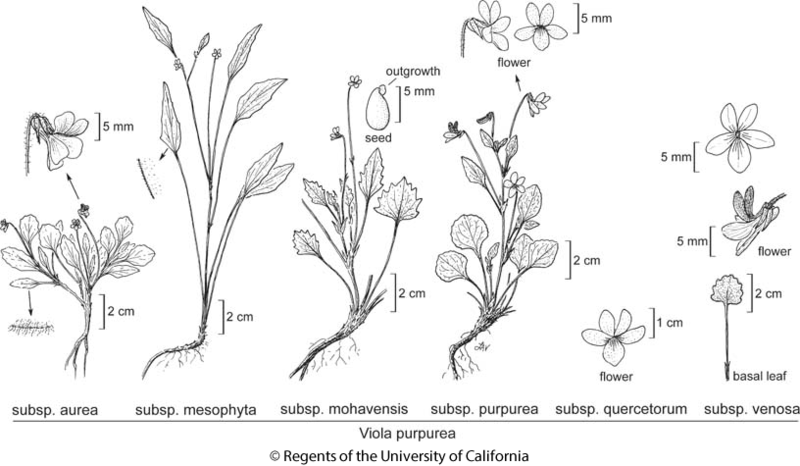 Citation for this treatment: R. John Little 2012, Viola purpurea subsp. purpurea, in Jepson Flora Project (eds.) Jepson eFlora, http://ucjeps.berkeley.edu/eflora/eflora_display.php?tid=53409, accessed on April 24, 2019. NW, CaR, SN, CW, SW, MP; Markers link to CCH specimen records. Yellow markers indicate records that may provide evidence for eFlora range revision or may have georeferencing or identification issues. Purple markers indicate specimens collected from a garden, greenhouse, or other non-wild location.